Every GameCube Controller Nintendo Ever Made. Ever. This is a list in celebration of the imminent release of Super Smash Bros. for Wii U, the GameCube Controller Adapter for Wii U and most importantly TWO NEW GAMECUBE CONTROLLERS! The ‘GameCube Controller Super Smash Bros. Edition’ will be the 24th (black) and 25th (white) varieties of Nintendo manufactured gamepad that’s compatible with the GameCube since its debut on September 14, 2001. I believe the Nintendo manufactured wired and wireless versions of the GameCube (GC) controller are the pinnacle of controller design; the most comfortable and satisfyingly clicky controllers I’ve ever had the pleasure of using. Things I love about the GC controller; the resistance of the analogue stick, the yellow nubbiness of the c-stick, the mushy D-pad, the shape of those handles, the deep L and R, the grey kidneys X and Y, the big green A, the little red B and even the lonely purple Z. Basically everything. What cements my belief that this controller the best is the release of two new versions (unchanged in design) 13 years after it was first launched. I can’t think of any other console controller with that length of lifespan. Can you? All Nintendo manufactured GC hardware was given a DOL product code number (abbreviation of the GC’s development name ‘Dolphin’). The code numbers ranged from DOL-001 to DOL-026 (plus DOL-101, which was the gimped GC produced after May 2004). I’ve only included control schemes with a DOL number as they were manufactured solely by Nintendo (plus a few interesting extras at the end). Below is a complete list of all the Nintendo manufactured GC controllers that have ever been available to purchase by the public in one way or another. All of the following wired controllers have the product code DOL-003. This was a launch colour scheme which could be bought standalone or bundled with a GC console of the same colour. Purple on top and bottom with the ‘Nintendo GameCube’ logo. This colour scheme and the GC console design led to some terrible people calling the GC ‘The Purple Lunchbox’. 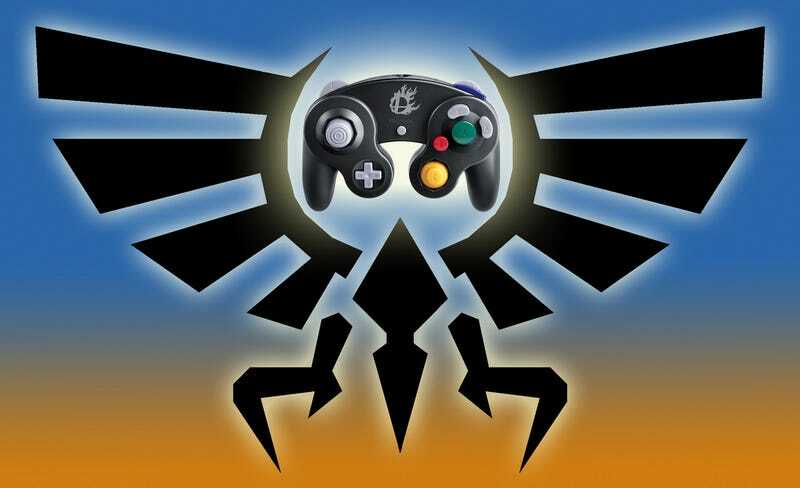 Black on top and bottom with the ‘Nintendo GameCube’ logo. This was a launch colour scheme which could be bought standalone in all regions or bundled with a GC console of the same colour. Orange on top and bottom with the ‘Nintendo GameCube’ logo. Released in large quantities in Japan but as limited editions in the US and EU. This was a colour scheme which could be bought standalone in all regions or bundled with a GC console of the same colour. Silver on top and bottom with the ‘Nintendo GameCube’ logo. This was a limited edition colour in some regions but it must have been a large run as it’s very common. This was a colour which could only be bought standalone in all regions. Purple on top and transparent on bottom with the ‘Nintendo GameCube’ logo. This was a colour scheme which could be bought standalone or as part of the console bundle ‘Pikmin 2 Special Edition Starter Set’ in Japan Only. Blue on top and bottom with the ‘Nintendo GameCube’ logo. This could only be bought bundled with the ‘Enjoyment Plus Pack’ and ‘Pokemon Colosseum Enjoyment Plus Pack’ console sets in Japan. Transparent on top and bottom with the ‘Nintendo GameCube’ logo. This could only be bought bundled with a GC of the same colour in Japan. Gold on top and bottom with the ‘Nintendo GameCube’ logo. It was called Pearl White in Europe and could only be bought bundled with a GC of the same colour or in the European exclusive ‘Mario Smash Football Pak’ console set. Pearlescent white on top and bottom with the ‘Nintendo GameCube’ logo. This could only be bought bundled with the ‘Tales of Symphonia Pak’ console sets exclusive to Japan and France. Mint green on top and bottom with the ‘Nintendo GameCube’ logo. This could only be bought bundled with the ‘Resident Evil 4 Limited Edition Pak’ console set exclusive to Europe. Silver on top and black on bottom with the ‘Resident Evil 4’ logo. This could only be bought bundled with the ‘Hanshin Tigers Enjoyment Pack Plus’ console set exclusive to Japan. Black on top and bottom with the ‘Hanshin Tigers’ logo. Hanshin Tigers are a professional Japanese baseball team. This Gundam themed controller could only be bought bundled with the ‘Char’s Cutomized Box’ console set exclusive to Japan. Light red on top and dark red on the bottom with a yellow ‘Neo-Zeon’ logo. This could only be bought bundled with the ‘Panasonic Q SL-GC10-S’ which was a hybrid GC and DVD player exclusive to Japan. Light grey on top and bottom with the ‘Panasonic SH-TGC10’ logo. Nintendo worked with Panasonic on the optical drive for the GC and as part of the deal Panasonic were allowed to develop and sell a DVD player that could also play GC games. The Panasonic Q console was the result of that partnership. This could only be bought standalone in Japan and was released during the lifespan of the Wii to take advantage of the Wii’s backwards compatibility with GC games. The only wired GC controller that doesn’t have a black cable (it’s white instead) and the cable is 3 m (9.8 ft) long, rather than the 2 m (6.5 ft) standard on all other wired GC controllers. This longer cable will also be a feature of the 2 new Smash Edition controllers. This could only be bought by members from the Club Nintendo catalogue for 500 points in Japan and in Europe for 3500 stars. Red on top and blue red on the bottom with Mario’s ‘M’ logo. The Japanese and European versions were the same hardware but had different packaging (the Japanese packing is much classier). This could only be bought by members from the Club Nintendo catalogue for 500 points exclusively in Japan. Green on top and blue on the bottom with Luigi’s ‘L’ logo. Yellow on top and purple red on the bottom with Wario’s ‘W’ logo. White on top and light blue on the bottom with the red ‘Club Nintendo’ logo. (DOL-004 & DOL-005) This was a standard colour scheme which could only be bought standalone in all regions. Light grey on top and bottom with the ‘Nintendo GameCube’ logo. The receiver (DOL-005) was the same light grey colour as the contoller. Silver on top and bottom with the ‘Nintendo GameCube’ logo. The receiver was the same colour as the light grey Wavebird receiver rather than sliver. (DOL-004 & DOL-005) This could only be bought from the Club Nintendo catalogue by members for an unknown amount of points exclusively in Japan. White on top and light blue on the bottom with the red ‘Club Nintendo’ logo. The receiver was the same colour as the light grey Wavebird receiver rather than white or light blue. (DOL-004 & DOL-005) This could only be bought by members through Club Nintendo Japan. There was a convoluted process to go through before you could purchase one of the 1000 ever produced. First you had to buy the game ‘Mobile Suit Gundam: Gundam Vs. Zeta Gundam’ then register it on Club Nintendo Japan between December 9th, 2004 and January 31st, 2005. Once this was done you could use 1,000 of your Club Nintendo points to purchase the controller. Light red on top and dark red on the bottom with a yellow ‘Neo-Zeon’ logo. The receiver matched the light red colour of the top making it the only non-grey Wavebird receiver ever produced. This can be bought standalone or bundled with ‘Super Smash Bros. for Wii U’ in all regions. Black on top and bottom with the ‘Smash Bros.’ logo. The cable is 3 m (9.8 ft) long, rather than the 2 m (6.5 ft) standard . This can be bought standalone or bundled with ‘Super Smash Bros. for Wii U’ in Japan only. White on top and bottom with the ‘Smash Bros.’ logo. Also includes a white cable that’s 3 m (9.8 ft) long, rather than the 2 m (6.5 ft) standard . (DOL-021) The bongo controller was available in all regions and was first released with the ‘Donkey Konga’ music game. They could be bought standalone or bundled with the games ‘Donkey Konga’, ‘Donkey Konga 2’ and ‘Donkey Kong Jungle Beat’. There was also a console set that included the bongos and ‘Donkey Konga’. ‘Donkey Konga 3’ was a Japanese exclusive. Brown plastic wood effect barrels with 2 rubberized drum skin buttons, it also has a small microphone and a start button. Microphone (DOL-022) and holder (DOL-025) shown above attached to a Wavebird Platinum. From my research I believe the microphone was only available bundled with the following games: ‘Mario Party 6’, ‘Mario Party 7’, ‘Karaoke Revolution Party ‘and ‘Odama’. The microphone and holder were bundled with the pinball RTS game ‘Odama’. I believe this was the only way the holder was ever available to purchase. It’s possible you could mail order just the holder direct from Nintendo but haven’t been able to confirm this. Microphone is grey with a blue button and the holder is clear. The microphone plugged into a memory card slot instead of a standard controller port. The microphone bundled with ‘Karaoke Revolution Party’ is black with a blue button. (DOL-024) This dance pad controller was available bundled with the game ‘Dance Dance Revolution: Mario Mix’ in all regions and to buy standalone in some regions. White and blue dance pad with a dancing Mario design in the centre. The pad has 4 directional buttons, A, B, Z and start buttons. ‘Dance Dance Revolution: Mario Mix’ was the only GC game the pad was officially compatible with. This is also, sadly, the only game where Waluigi is the main antagonist. This official Capcom licensed GC controller was made by NubyTech and each one is numbered from a limited edition of 50,000. It was branded with the ‘Resident Evil 4’ logo on the packaging and was released as a standalone product 3 months after the game was first released for GC. It’s a yellow bodied chainsaw shaped controller that contains every button that is found on a regular GC controller. Also each one has unique ‘blood’ splash pattern making no two the same. It comes on a display stand moulded to look like wood with rocks and no, the chainsaw blade doesn’t move. There was also a red bodied chainsaw controller that had additional motion controls built in released for PlayStation 2 later in 2005 when Resident Evil 4 was ported to that console. This is an official Nintendo licensed controller that could be bought standalone in all regions. It was marketed to be used with the GC Game Boy Player and is the shape of a SNES controller. It adds a select button but doesn’t include the analogue stick, c-stick and also the L and R buttons lack the pressure sensitivity of the standard GC controller. Indigo purple top and bottom with a ‘Hori Nintendo Gamecube’ logo. There was also a black version available in all regions. This official Nintendo licensed GC controller was available to buy standalone and it was released at the same time as ‘Phantasy Star Online Episode I & II’ for GC. It was marketed as compatible with Phantasy Star Online and had the logo on the box. It is an off white colour on top and indigo purple on the bottom with full alpha numeric keyboard built into the controller. Each keyboard controller has 2 cables that have to connect to 2 controller ports on the GC console (one for the keyboard function and one for the controller function I assume). This official Nintendo licensed GC controller was available to buy standalone and it was released at the same time as ‘Phantasy Star Online Episode III C.A.R.D. Revolution’. It was marketed as compatible with Phantasy Star Online Episodes I, II and III and had the game logos on the box. It is an off white colour on top and black on the bottom with full alpha numeric keyboard built into the controller. In some North American hotels, a service called LodgeNet was available which provided pay-per-play access to select GC titles. To facilitate this, a specially-designed variation of the GC controller was created. In addition to the standard GC controller buttons and sticks, the LodgeNet controller features six additional buttons which are used to control the on-screen game selection interface. Black on top and bottom with ‘LodgeNet’ logo and extra buttons, it also has a very long coiled cable and the end plug is a modular connector, standard for telephone wires. Notice the ‘Nintendo’ logo above the control stick as well – this isn’t present on any other GC controller. Interestingly the back of the controller has the text ‘© 1997 Nintendo’ even though the GameCube controller wasn’t released until 2001. This LodgeNet version has small rubber feet on the back which may have been to protect it from scratches or possibly so it didn’t slip of the table in the hotel rooms. Also the screws are covered with plastic caps to prevent tampering. Last week GiantBoyDetective wrote a post, ‘ A Beginners Guide to Collecting Video Games’ of which the first tip is to ‘Find a Focus (or Don’t)‘. It’s good advice - I’m a general Nintendo collector but my focus is GC controllers and it’s given me great pleasure over the years to research and slowly buy each one. I’m a long time Kotaku reader (8 years!) but I’ve never had an account, never commented on an article and never posted my own content until now. I’ve wanted to do this for a long time and with the upcoming release of Smash Wii U I got spurred on to write this list. It’s a great feeling to be able to share my collection with you in this way - I hope you like it! If you have any questions, further info on any controllers or any amendments to release dates and regional availability please let me know in the comments.